This month we take a look at the work of a notable New Zealand-born architect, Keith Murray. 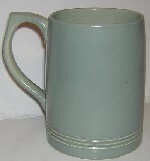 Best known for his work with Wedgwood from the early 1930s through to the late 1940s, Murray left a legacy of simple and stylish pottery that has become very collectable. Eschewing decoration in order to emphasise form, Murray's work has a simple and sometimes slightly architectural appearance, and due to the shapes used, often had to be hand-thrown and then engine-turned on a lathe to apply his frequently-used banded and ribbed designs. The plain glazes used to decorate much of Murray's Wedgwood work were designed by the then Wedgwood Production Manager, Norman Wilson, and he must be given some credit for helping to create the distinctive Keith Murray style. However, the rarest of all the pieces were not slip-glazed but instead made from Wedgwood's trademark black basalt, and an even rarer variant, bronze basalt. More expensive to make and to purchase when new, these pieces are hard to find and by far the most expensive to buy today. Highlighted this month is a Keith Murray vase in one of the most popular shapes, the shoulder vase (shape 3805). Standing 11.5 inches tall, this is an imposing piece and looks well in Moonstone (White), a popular colour. 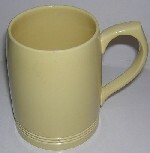 Pictured as well are several Keith Murray-designed tankards or mugs. Made in a variety of shapes and colours, these make an ideal affordable introduction to collecting Keith Murray, or alternatively a slightly indulgent (but very practical) coffee, tea or beer drinking vessel! Other shapes to look out for are the confusingly similar 3802 and 3765 shapes. Known variously as football or bomb vases, both shapes are desirable but 3802 is rarer and more valuable than 3765. There are several other spherically shaped vases; as a general rule all are quite scarce and collectable, selling for several hundred pounds and upwards. 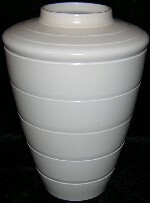 One other late addition this month is this Troika Rectangular vase. This shape reminds me (very slightly!) of a totem pole, and I think that the pattern on this example is particularly well suited to the shape. Decorated by Colin Carbis, this vase can be dated 1976-77 as Carbis only worked at the Troika Pottery for one year, making his pieces relatively scarce.